Thanks to Dianne Wright and John and Vicki Harris for their help in researching this Curtis branch from which they are also descended. Our Curtis line originated from South Perrot, Dorset. Some members of the family moved to Islington, London prior to 1881. These have been traced, but we know little about those that stayed in Dorset. I had managed to trace our line to at least a Roger Curtis who married Dianah Saint (daughter of Henry Saint and Dinah Frampton) at Broadwindsor in 1763. I believe this to be the same Roger who was a Cordwainer, and mentioned in the 1807 Dorset Poll Book living at South Perrot. However, in a Settlement certificate of 1740 I found a Roger Curtis apprenticed to a Cordwainer called Daniel Bryant of Mosterton. As most apprenticeships took place at the age of about 14, this would fit in with the aforementioned Roger being born in 1725. This being the case, he was most probably the Roger Curtis baptised on 26th December, 1725 at South Perrott, the son of another Roger Curtis and Mary Ham. This being the case, a will dated 1736 and proved 1746 exists for a Roger Curtis, Clothworker of South Perrott and mentions sons Roger, Thomas and John. This Roger was probably the Roger baptised on 16th October, 1689 at South Perrott, son of yet another Roger Curtis and Joan. Agnes Curtis was a witness to this second will. Who was she? Wife or sister? Roger was buried on 29th December, 1736. There was also a Mary Curtis buried on 9th May, 1736 (possible a wife?). From his Will we also know that his brother-in-law was John Ham, of Haselbury Plunkett in Somerset. He had at least three sons all born before 1736: Roger Curtis, Thomas Curtis and John Curtis. All of them were minors at the time of the will, although he made his son Thomas sole executor. The will was not proved until 1746. Why did this taken 10 years? Roger Curtis bp 14.10.1750 South Perrott, m 29.10.1772 Corscombe to Elizabeth Ellis, bur 17.2.1824 Corscombe aged 73. Roger was mentioned in the 1807 Poll Book of Dorset as being a Freeholder living in South Perrott. He died there aged 83 in 1809. He was buried on 15th November 1809. I have since found that he left a will dated 11th October, 1809 and in proved in 1810. His will follows. It mentions his three surviving sons from his first marriage plus all his surviving children by Dinah plus a Mary now married to Mr. Spurdle. Dinah Curtis was buried on 26th July, 1821 aged 83 at South Perrot, St Mary. Sarah Curtis bp 11.11.1777 Corscombe, bur 1777 ? Roger died in 1824; he was buried at Corscombe St Mary on 17th Feb, 1824, aged 73. I have been unable to find these children in the burial records. Charlotte and Samuel would then have just had time to have their first son Henry who was buried in April 1810, if he died soon after birth. Samuel was a dairyman at Chilton, Somerset in 1813, where his son Henry was privately baptised. On the 1841 census Samuel was shown as an agricultural labourer living in Mosterton with his son John, a shoe maker. There was no mention of Charlotte, so we assume that she had died before 1841. [The NBI version 2 confirms this with a burial of Charlotte Curtis on 9th Oct, 1823 at Mosterton St Mary. She was only 35 years old and must have died soon after the birth of George or perhaps a later child.] Samuel died on 17th March, 1851 at Mosterton and was baptised on 23th of the same month. George Curtis was born in Thorncombe in about 1821, according to the 1861 census, although he wasn’t baptised until 1826 at Mosterton. 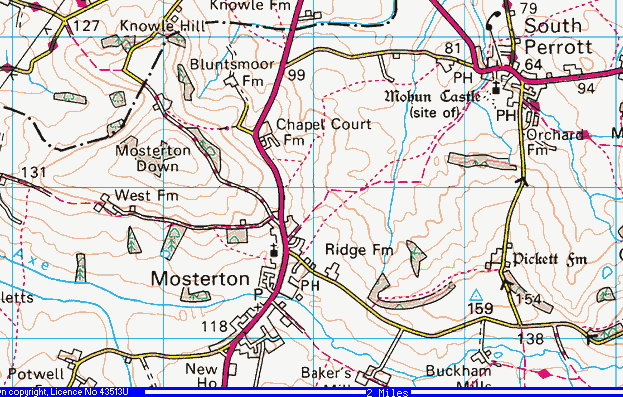 In 1841 he was living at Chapel Court Farm, Mosterton 5. His future wife, Sarah Groves, daughter of John Groves and Elizabeth Walden (info many Thanks to Don Groves), lived at the neighbouring Bluntmoor Farm. They married at Wytherstone parish church, Powerstock near Beaminster on 17th February, 1846 (the witnesses were Henry Curtis and Hester Groves). George was a dairyman at Chapel Court farm, the tenant of which was William Daubeny. The owner of the farm was Rev’d W.T. Cox who was also the owner of Potwell Farm, Littlewindsor. George obtained the tenancy of Potwell farm around 1863. Sarah died in 1874 and was buried in Mosterton on 1st December, 1874. George then married a widow, Lucy Perry (nee Hawkins), daughter of John Hawkins and widow of Francis Perry on 21st March 1876 at Broadwindsor parish church. Lucy was also the mother of his daught-in-law Georgina. At some stage they moved to London where George died on 7th February, 1881, at 50 Chatsworth Road, Forest Gate, West Ham, aged 61 6. His widow Lucy then lived with her son-in-law/stepson, Charles, in Islington. [I have recently discovered, through the internet, the grand-daughter of Augustus Charles Curtis; Vicki Harris, and we hope to pool our resources and continue the search beyond Roger. Thanks Vicki and John, for your help, so far]. Ethel Violet Curtis born 1894 Islington, m 1923 Lewisham to Leonard Renolds, d 22.8.1957 Doris May Curtis b 1904? It is believed that the family ended up with two or three butcher shops in the Islington area and that they were sold about 1922. This would be about the time when Robert’s wife Sarah died at 19 Narford Road, Upper Clapton. Robert died on 26th December, 1940 at Hackney Hospital. Both are buried in Abney Park Cemetery 8. The family can find no trace of Doris. It is from family memory that she existed!! By 1932 Augustus and his family were living at 19 Narford Road, Stoke Newington. At the beginning of the War, Augustus went to Crawley with the Ordinary Branch Valuation Department. He and Louisa moved to a bungalow at 13 South Drive, Cuffley, Herts in 1945/6. He retired from the Pearle on 30th November, 1953. Later, in 1959 they moved to 27 Haynes Road, West Worthing, where they lived until his death on 10th May, 1962. Louisa continued to live in Worthing until her daughters moved to Bridport, Dorset where she eventually died in 1973. 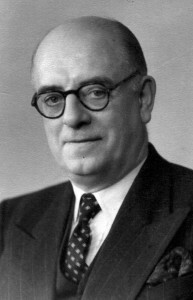 The photo opposite is one of Augustus Thomas George Curtis taken in about 1953, when he retired. Doreen, my great aunt married Laurence Stanley Dellor Howard, son of James Williamson Howard and Rose Alma Dellor, on 17th September, 1932 at the parish church of St. Michael and All Angles, Stoke Newington. Edna, my nan, married Robert William Streatfield, son of Robert Charles Streatfield and Louisa Maria Hayes in October 1934 at the same church. 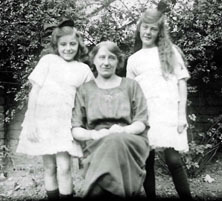 Below is a photo of Doreen and Edna with their mother. And if they are the same, what is the connection to our Roger, clothworker? My wife and I lived in Broadwindsor for 4 years and have just moved back to Essex. There are still many of the Curtis family there. Along with the Saints and the Framptons. These are probably the most commomn surnames in the village. Does that help? Hello Juliet, I am researching a history of Sort, a cottage and barn which used to be part of Wytherston Farm, near Powerstock. In 1882, letters that are now in the Dorset History Centre show that the tenancy of Wytherston was taken by a John Curtis, whose son lived in a house that used to be at Sort, but burned down in 1910. James died soon after 1901 and his son, John, moved away soon afterwards. Before coming to Wytherston, James had been a tenant of the Vicar of Rampisham, who gave him a very good reference. You don’t know how he might fit in to your family tree, do you? It seems strange that George Curtis and Sarah Groves married at “Wytherston parish church”, if there was no connection. 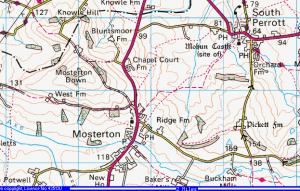 Though in fact, there does not appear to have been any church at Wytherston after the Dissolution of the Monasteries, when Wytherston became an adjunct of Powerstock – so perhaps that is where they got married. Do and I can show you some of James’ letters – though of course, I would be very interested if you knew anything more about James and his son John. We also met a very nice chap called James Curtis, who is the grandson of James the son of John. Perhaps you know them? Sorry for the delayed response, it seems my email notifications have stopped working. My Curtis line went off to London by 1881. I am afraid that I have no knowledge of the cottage of Sort and I do not appear to have a James Curtis of that generation in my tree. Sorry that I cannot help. I know that there were a lot of Curtis’s at that period and your could have been from a branch that I have not yet discovered. best of luck in finding the information. I am trying to search for George Curtis in my family tree. In the 1861 Census it is recorded that he was born in South Perrot around 1814 (listed as being 47 in 1861). He was a carter and married to Selina and the census lists she was born in Melbury Osmond. 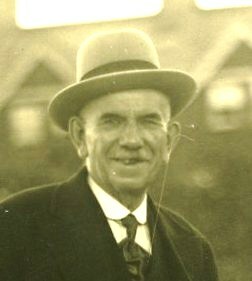 His children were Esau Curtis born in Cattistock 19 yrs old in 1861 census, George Curtis 17 in 1861 born in Cattistock, Samuel Curtis 11 years in 1861 and born in Swyre and Emily Curtis, 9 years old in 1861 and born in Swyre. The family then seems to have moved to working around the Cheselbourne area. I would like to work further back, but can’t find any George Curtis who was born around those dates in South Perrot and who went on to marry a Selina. I would be grateful if you have come across any links to our line of Curtis’s from South Perrot. I am so sorry that I have just seen this message on my website. It is supposed to email be notifications but it has not been and I have missed about 5 messages in the last 6 months! Leave this one with me as I have several branches from South Perrot which may be hiding your George. I will get back to you if I find anything!